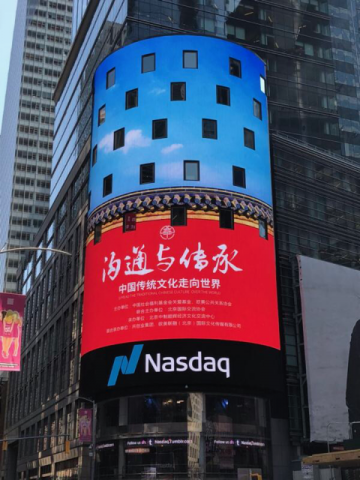 Chinese Traditional Culture Going Global Program “Communication and Heritage” showed up on Nasdaq Screen on Aug 24, 2018, in New York City. 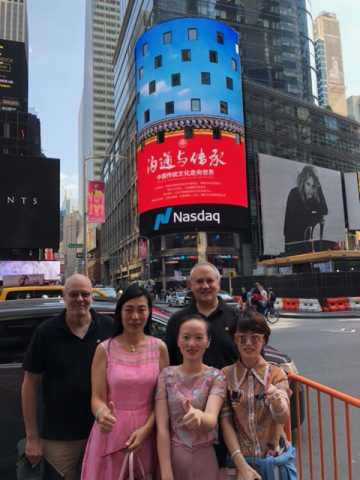 The Communication and Heritage program was a joint project by Caring Foundation By CSWF, European and American Public Relations Association, Beijing International Exchange Association of China. It aimed at taking Chinese culture globally, encourage the cultural exchange between China and the world, as well as promoting Chinese traditional culture going global. New York is the first stop of Chinese Traditional Culture Going Global world exhibition program “Communication and Heritage.” The program collected art items representing Chinese traditional culture from all over China. The categories include visual art, audio art and touching art. They show audience different aspects of Chinese traditional art. This collection includes Wang Yi Pin Chinese brush shop’s “Lan Ting Xu Special Hu Brush” and outstanding art pieces from Chinese top artist Mr. Cai Yong’s birds and flowers painting series. The collection uses high tech such as air reflection, shadow reflection and light reflection to show the accomplishments of Chinese traditional culture. Viewers can enjoy the beauty of Chinese traditional art closely. The world is at a cross-culture combination stage and culture is the soul of a nation. It is a nation’s collective memory and spirit. Chinese culture has a long history with elements from all over the world. It has very important social value and treasure of our world. Studying Chinese traditional art has become a global trend. The Chinese traditional culture going global “Communication and Heritage” program shows a different China to the world. It shows a different China to the world and reflects the combination and communication of Chinese traditional culture and world cultures. It gave a strong voice from China to the global culture.